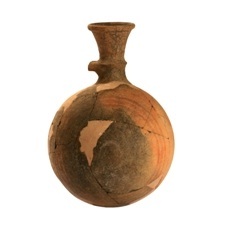 Archaeologists in the eastern Mediterranean region have been unearthing spherical jugs, used by the ancients for storing and trading oil, wine, and other valuable commodities. Because we're used to the metric system, which defines units of volume based on the cube, modern archaeologists believed that the merchants of antiquity could only approximately assess the capacity of these round jugs, says Prof. Itzhak Benenson ofTel Aviv University's Department of Geography. Now an interdisciplinary collaboration between Prof. Benenson and Prof. Israel Finkelsteinof TAU's Department of Archaeology and Ancient Near Eastern Cultures has revealed that, far from relying on approximations, merchants would have had precise measurements of their wares — and therefore known exactly what to charge their clients. The researchers discovered that the ancients devised convenient mathematical systems in order to determine the volume of each jug. They theorize that the original owners and users of the jugs measured their contents through a system that linked units of length to units of volume, possibly by using a string to measure the circumference of the spherical container to determine the precise quantity of liquid within. The system, which the researchers believe was developed by the ancient Egyptians and used in the Eastern Mediterranean from about 1,500 to 700 BCE, was recently reported in the journal PLoS ONE. Its discovery was part of the Reconstruction of Ancient Israel project supported by the European Union. The system of measurement was revealed when mathematician Elena Zapasskyconstructed 3D models of jugs from Tel Megiddo — an important Canaanite city-state and Israelite administration center — for a computer database. The jugs are associated with the Phoenicians, ancient seafaring merchants who had trading hubs along the coast of Lebanon. Using a statistical methodology, the team measured hundreds of vessels from the excavation, and discovered something surprising — large groups of these spherical or elliptic jugs had a similar circumference. This prompted the researchers to look more deeply into how the ancients measured volume. The Egyptian unit of volume is called the hekat, and it equals 4.8 liters in today's measurements, explains Dr. Yuval Gadot, a researcher on the project. A spherical jug that is 52 centimeters in circumference, which equals one Egyptian royal cubit, contains exactly half a hekat. "In a large percentage of the vessels we measured, the circumference is close to one cubit, and the merchant could know that the vessel's volume is half a cubit by just measuring its circumference," he says. When the researchers adopted the Egyptian system of measurement themselves instead of thinking in metrical units, many things became clear. For example, the tall round "torpedo" jugs packed into Phoenician ships in the 8th century BCE were found to contain whole units of hekats. Dr. Gadot believes that the Egyptian system of measurement gradually disappeared when the Assyrians took over the region, bringing their own methods of measurement with them. According to Prof. Finkelstein, elements of standardization in the ancient world hold interest because they are indicative of bureaucratic systems and reflect political and cultural influences. "The use of the Egyptian method is a strong indicator of Egyptian power in this region during a specific period of time," he explains. "Working together with experts in mathematics and statistics, we have been able to provide new solutions for longstanding archaeological problems and debates."